It was then that I remembered that I had first seen questions about Werrity in the Guardian, and it had had a picture of both of them in Sri Lanka on the occasion of the Kadirgamar Lecture. I asked Jason then whether he knew who had sent the Guardian that picture, and he immediately responded to the effect that he understood what I meant and thought it a relevant question. I suggested that he do some research into that, which he seemed to agree should be done. Soon after he put the phone down, I came across an email which tied Fox to a programme I was to participate in the following day at the House of Commons. This was a screening of ‘Lies Agreed Upon’, the film produced by government to refute what Channel 4 had shown about Sri Lanka. The email carried an article that had appeared that day (October 11th) in the Sri Lanka Guardian which claimed that a decision had been made suddenly by our High Commissioner, Dr Nonis, to restrict the programme ‘to MPs and peers only’. The article went on to say that the programme was being kept under wraps except by the SL Guardian and that ‘Channel 4 news who had featured the “Sri Lanka Killing Fields” documentary have also very reluctantly decided to avoid carrying this story due to political pressures from above. 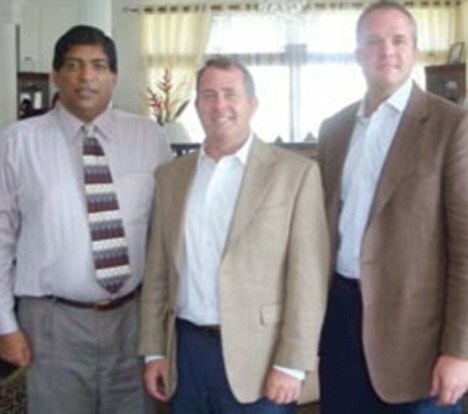 The Sri Lankan High Commission have successfully managed to covertly have pressure applied to them via their sources linked to Dr. Liam Fox and his associates at number 10 Downing Street’. This gratuition juxtaposition of Channel 4 and Dr Fox (along with associates at 10 Downing Street), neither of whom had anything to do with the programme arranged in the House of Commons, seemed to me to confirm that the LTTE rump was one source at least of the attack on Dr Fox. I accordingly sent Jason a copy of the email. A few minutes later the telephone rang. It was a lady called Polly Curtis from the Guardian in London. Jason had evidently contacted her, but I cannot be sure whether it was because of the email I had sent him or not. She asked more questions about Dr Fox and Bell Pottinger, which surprised me since I had not thought there was a connection between them, and all Jason had told me was that Bell Pottinger was close to the Conservative Party and its head, Tim Bell, was a friend of Fox. Polly however went further and told me that she believed Adam Werrity had attended meetings Bell Pottinger had had with Sri Lankan officials. She seemed to think this had happened in London. She also wanted to know about Bell Pottinger’s involvement in the meeting at the House of Commons. I told her there was none, but then she told me that it had been alleged by the SL Guardian that they were behind that. It turned out then that there had been an earlier story about the meeting, and that the SL Guardian had claimed on October 10th that ‘The High Commission has decided to keep the meeting secret from the Tamils having dealings with them, fearing news will leak out and cause problems. The newly appointed High Commissioner Dr Nonis and his assistant Mr Amsa are said to be using the expertise of government’s PR guru Bell Pottinger and the controversial All Party Parliamentary Group Head Lord Nesabit to secretly hold this meeting’. This was astonishing, and I suggested to Polly that she would do well to investigate the source of these strange allegations that were clearly intended to denigrate the High Commission. The fact that on the following day Dr Fox was also connected to the meeting in the Commons lends further strength to the belief that the pro-LTTE lobby are doing their best to rouse suspicions against Dr Fox and Sri Lanka together. Sure enough, a few minutes later, Polly sent an email to the High Commission with some questions relating to the meeting, notably to ask why it was restricted and why Tamils had been upset. I called her and said that the restriction was because it was intended to address the questions that had been raised during the recent debate on Sri Lanka in the House, and we hoped that MPs and representatives of think tanks who would have an informed view would attend. Both Sinhalese and Tamils who had attended previous meetings on other topics had been left out, but the High Commission planned to have further screenings, including for the media. Polly’s final question was about the involvement of Bell Pottinger, as to which there was none, the original idea having come from a member of the Sri Lankan Liberal Party now living in Britain. Whether Polly or Jason will look into the source and purpose behind some of the allegations remains to be seen. But meanwhile Channel 4 has true to form done what the Tigers want, in an article headlined ‘Liam Fox friend accused over Sri Lanka arms deal’. Will the Guardian follow suit, or will it go deeper into the question and find out what has been happening to ensure such intense pressure against Dr Fox?